This Albuquerque-based high performance computing (HPC) systems integrator wanted to increase their sales leads at SuperComputing, the industry’s premier annual conference. 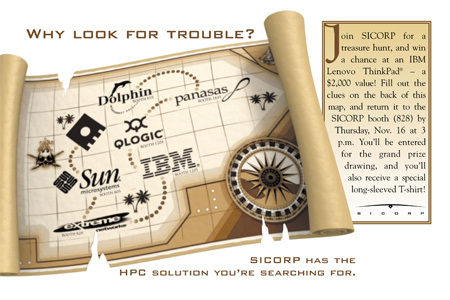 Using a pirate treasure hunt theme, these postcards were sent to 1,000 pre-registered attendees to generate interest. Aided by a grand prize drawing and T-shirt giveaways, the campaign generated 749 leads—a 40% increase over the previous year and a 114% increase from the year before that.